"The secret things belong to the LORD our God, but the things revealed belong to us and to our sons forever, that we may observe all the words of this law." (Deuteronomy 29:29). Before we go on, I need to share where our confidence and knowledge of worry comes from. You will hear many people promoting their own solutions. You have every right to understand my authority. If you take a medicine, you do not only examine the claims of a medicine but also the authority of the one promising help. The Bible speaks clearly of a Creator God who completely knows and understands all things. God as the Designer is greater than the design or the designed. This means that God claims to know all the ins and outs of mankind. All knowledge is known to Him. But from our perspective, it is either 'Hidden Knowledge' or 'Revealed Knowledge.' Hidden knowledge includes the many secret things that He alone knows; we will never know. That is fine with me because I already have trouble handling the knowledge I now need to remember! On the right, we see a box called Revealed Knowledge. This is information that God has decided to let mankind know. His own people have access to this database of critical information because they have God's Word. If there was a solution for death, would you want to know? If there was a way of knowing God, would you look? What if there was a way to get rid of anxiety and find peace? Would you obtain it? The Bible is this source of information given to man. 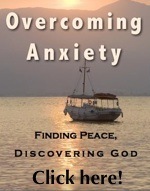 God has revealed to us what we need to know to eliminate these anxieties and worries that we face. Throughout this series, I will be sharing from this database of revealed knowledge. It is our special gift as His children. You might wonder how do you go about finding this knowledge. God has revealed a lot of His knowledge to us, but it is carefully tucked away here and there. If you search diligently, you will find it all here in His Word. What we want to do is to discover what has been hidden. "The beginning of wisdom is: Acquire wisdom; And with all your acquiring, get understanding. "Prize her, and she will exalt you; She will honor you if you embrace her. "She will place on your head a garland of grace; She will present you with a crown of beauty." (Proverbs 4:7-9). If we refuse to seek this wisdom about daily living, it will result in living like the world which lacks this special information. If any generation understood the importance of knowledge, ours does. Let us therefore gain the knowledge that He has revealed. It is all that we need.